Sri Guru Amar Das, though born in 1479, became the Guru in 1552 when he was in his seventies. Guru Amardas ji were born as Bhalla Khatri at village Basarke about 13 kms south-west of Amritsar. His father was Tej Bhan Bhalla,, a local petty trader. They were all staunch sanatanists, and vegetarians. Guru Amar das had a wife, two sons and two daughters. He often went to Haridwar and Jwalamukhi on pilgrimages and strictly observed all religious rites and ceromonies. Before coming into contact with Sikhkism Guru Amar Das had crossed sixty years of age. His brother Manak chand lived nearby his house, Manak Chand's wife Bibi Amro use to sing Guru Nanak's hymns. Bhai Amar Das (Later Guru) must have heard her singing many times before. He engquired whose hymns she was singing and immediately made up his mind to call on Guru Angad. It was in 1541, when Amardas was 62 years old. 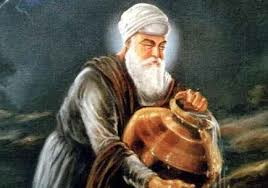 Guru Amardas ji were on Guruship from 1552 to 1574, he moved to Goindwal from Khadur to avoid conflict with Guru Angad's son's., elder of whom named Datu had declared himself as a Guru. All the same he took many significant steps. He established new centres for conveying to the people the message of Guru Nanak. Guru Amardas ji, condemnned Hindus for Sati, allowed widow remarriage and against Caste systems he started Guru Ka Langar. He passed on his Guru Ship to his son in law, Ramdas Sodhi, who was his most devoted disciple. Guru Amardas ji organised the proleystaion of Sikh faith into Manjis. He divided the area into 22 branches called Manjis and appointed a local Sikh preacher at each place. The preacher sat on a Manji (a cot) while the congregation all around it. Here are the name of the people he appointed to preach Sikhism. 1. Manak Chand Jhinwar (Water Carrier) at Variowal in Amritsar. 2. Sada ram, a Blacksmith near Amritsar. 3. Hindal at Jandiala near Amritsar. 4. Gangu Shah banker at Lahore. 5. Mutho-Murari, a devoted couple, at Chunian in Lahore Dist. 1. Paro Julka at Jalandar. 2. 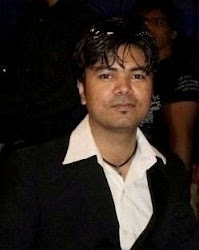 Mahesh Dhir at Sultanpur Lodi. 1. Sawan mal, Nephew of Guru Amar Das, at Haripur Guler. 2. Name not given, at Dharamsala. 2. Mai Das Bairagi in charge of Ludhiana dist. 3. Mai Bhago at village Wayun, tehsil Kharar, dist. Rupar. 4. Mai Sewan at Village Gardnoh in Patiala District. 5. Sachna Shah in charge of Ambala distt. 1. Lalu in chage of some area in Sind. He started the system of holding two annual gatherings of his disciples from all over the country. At his headquarters, he undertook the construction of a baoli (a well with a perennial source of spring water). For the Sikhs the headquarters of the Guru and this baoli became a holy place of pilgrimage. 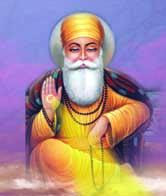 Guru Angad had collected the hymns of Guru Nanak. To these Guru Amar Das added the hymns of the former as well as his own. Guru Amardas appointed three women as preachers was a unique contribution of Amardas. Guru Amardas ji were highle pleased with one of his disciple named Bhai Jetha, first Guru Amardas ji married his daughter Bibi Bhani to Bhai Jetha, and then delighted with the couple's devotion, he passed on the Guruship to Bhai Jetha as Guru Ramdas. In his devotion to Guru Nanak, Guru Angad, God and his Sikhs Guru Amardas was as firm as a rock. He departed from this world on September 1, 1574. They administered both to the religious and the temporal needs of the disciples; for, in the Guru's system legitimate temporal needs were included in the religious needs. They collected offerings from the disciples and sent them to the Guru for the common use of the community. The Guru himself earned his living as a small tradesman. As an anti-caste and anti-pollution measure, he made it incumbent that no one, irrespective of his status or caste, could see him unless he had first partaken, along with others, of the food cooked at the common kitchen. Emperor Akbar had also to dine at the langar before he met the Guru. In his time, ascetics and recluses again made an attempt to enter the Guru's flock. But the Guru issued a final injunction that no recluse or ascetic could be a Sikh. He also denounced the system of sati and of purdah among women.